The Samsung Galaxy Mega might have been available in various stores in Malaysia and online with free shipping to Malaysia for quite some time now, but now, it’s officially available via official Samsung resellers. 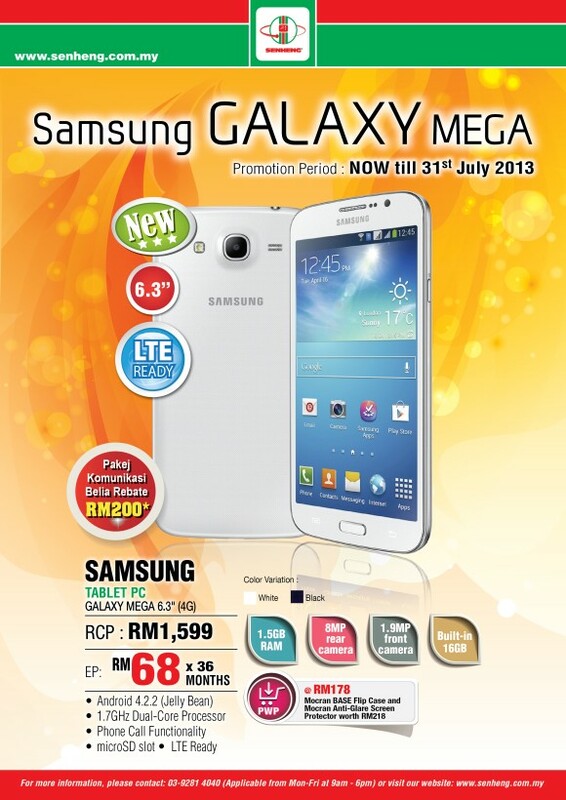 Senheng is now offering the Samsung Galaxy Mega 6.3 with LTE connectivity at RM1,599; they are even offering monthly repayment scheme from as low as RM68/month. The unit offered by Senheng is a 16GB flavor with LTE connectivity on board and you can pick either a black or white flavor. Additional offers given by Senheng is a PWP promotion that can score you a branded flip case and anti-glare screen protector at RM178. More information about the device available on the product page or visit our previous post for more information about the gigantic phablet from Samsung.